Sorry, 'Triple Pet Toothbrush' has been discontinued and is no longer available. Please check our related products, categories, or store search. The Triple Pet toothbrush gets the job done faster, easier and better. The three flexible heads maintain the proper pressure on all surfaces of the tooth with every stroke. In addition to the standard top bristles, the two side bristles are at the proper 45 degree angle for thorough surface cleaning while the soft outer bristles massage and stimulate your pet's gums. The bristles are in cleaning contact with every exposed part of each tooth, small or large, and in massaging contact with the inner and outer gum lines in a single stroke. Fitting snug to all exposed parts of the teeth, top, front and back, it is much easier for you to keep the brush on your pet's teeth even if the animal moves. 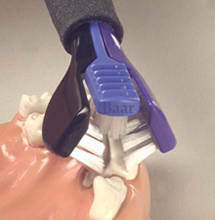 The backside of the brush head is configured as a tongue scraper. Brushing your pet's teeth is a major step to keeping your pet healthy and happy. Brushing wards off bad breath, gum disease and other mouth infections. There is a scientifically proven connection between unhealthy gums and heart disease. Triple Pet is the only pet toothbrush with a padded handle giving you a better grip, even when wet, while also providing greater protection to your pet's sensitive mouth area. Furthermore, it is the only pet toothbrush based on a brush that is Accepted by the American Dental Association. NEW PET TOOTHPASTE! Our new all natural Triple Pet Toothpaste has a natural vanilla flavor that pet's love plus it contains a tartar control formula and a touch of tea tree oil for healthy gums. Since it is sweetened with stevia, a natural herb, it is sugar free and provides a clean sweet breath for your pet. A key feature is the toothpaste is non-foaming so no rinsing is necessary after brushing. For more information on toothpaste, please click on the image below. Suggested Use: Brush teeth as usual to effectively remove plaque from teeth and gumline. Clean and massage the gum tissue inside using short quick horizontal strokes. Be sure to reach the back teeth. Start slowly and give your pet lots of praise. Your pet can learn to enjoy the process. Brush at least 3 times a week.